It looks as though RIM has removed a huge barrier to entry to deploying the BES Express in organizations. Up to now in order to take full advantage of the BES experience you needed to pay your carrier an additional $10-15 per month for a BES Data Plan. The "BES Tax" gave you a service book on your device which allows for over the air activation. BES Express has been very popular with the corporate world because of this $0 price tag. However activating devices on a carrier BIS plan can be a headache. If you're unfamiliar with this process, to activate a new BlackBerry on the company BES you would just need to ask your BES Admin for an activation password. 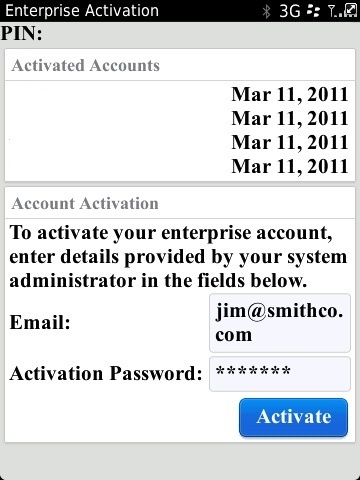 Once he assigned you the password, go to your BlackBerry under Advanced Options there would be an option called "Enterprise Activation", type in your email address and the assigned password and click Activate. After a short period of time your device is fully provisioned on the BES all without connecting to any desktop software. BUT if you were not paying your carrier's BES Tax this Enterprise Activation option was never pushed down to your device via Service Books so Desktop Manager was your only option for activating your new BlackBerry. Today thanks to RIM BES Express users now live BES Tax-free. They've put a new App in BlackBerry App World which gives you an Enterprise Activation option on your BlackBerry with a BIS data plan. No real suprises with supported device list (except 9780 noticeably missing) your device must be running BB OS 5.0+. So if you're still rock'n a BlackBerry 8700 with the side scroll wheel you'll need to continue activating via Desktop Manager.